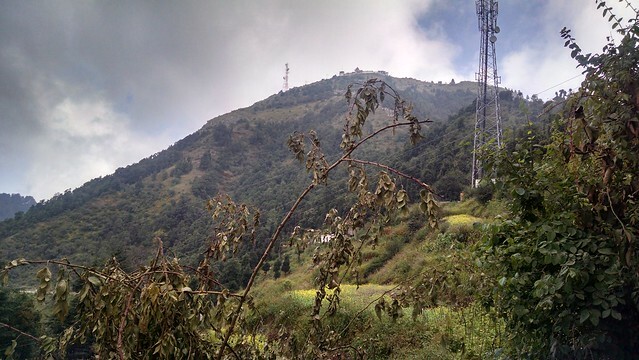 Nearly 8 kilometers away from Dhanolti, lies the Surkanda Devi Temple on the top of a peak. Nearest point till one can get conveyance is Kaddukhal. Buses and Taxis are available from Chamba and Dhanolti to Kaddukhal. From Kaddukhal there is a steep trek of about two kilometers to reach Surkanda Devi temple. Seeing the horses which some people use to climb the hill made me remember a road in Kufri near Shimla that was so dirty because of these horses. 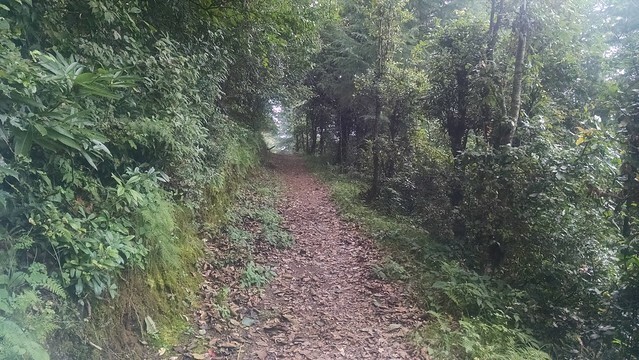 To my surprise, the way to the Surkanda Devi temple was not full of horses and it was very clean. Seeing the Temple from the gate makes the climb difficult. It looked like it was situated very high and very far. This can give you mixed feelings, first, of a task that is very difficult and second, of a challenge to achieve something that is very difficult. With those feelings, we started the climb. 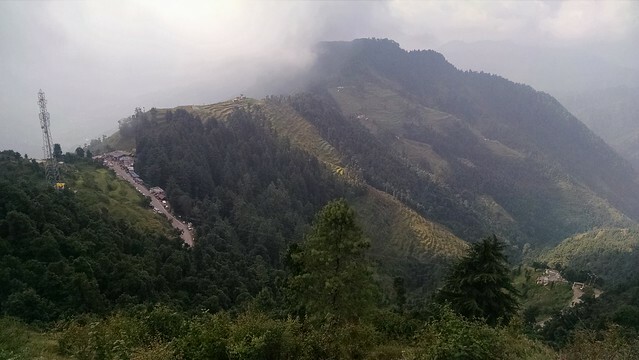 We would stop at many points to see the beautiful surroundings and also the road to Dhanolti where moving vehicles looked so small. Kaddukhal was a very small settlement as looked from the steps. Beyond those shops which give you items of worship there were few step farms. As with the human thinking of "The grass is greener on the other side", I wanted to be on those step farms which looked like they were so carefully constructed with few trees here and there. But before that, I had to complete the trek to the temple. With the lifestyle that we live of a sedentary worker, this climb was difficult and we had to rest few times. There were good arrangements for that and this also provided an opportunity to stop and look around and capture the shots. Seeing from there the clouds which were touching the other shorter peaks were looking as if they were originating from those peaks. Deep down between the two peaks we could spot few houses. In the next moment, clouds would block the view. That day the weather was so pleasant due to the presence of these clouds that we reached the temple in less than one hour without too much effort. 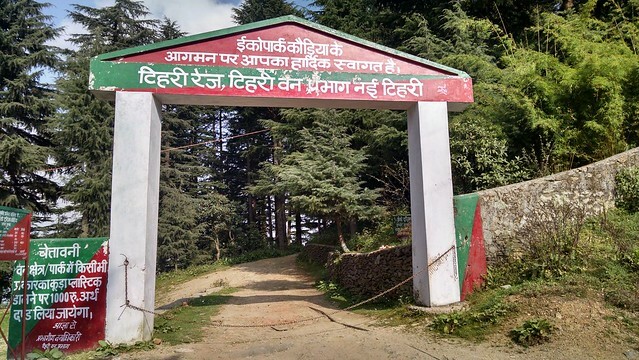 The legend behind Surkanda Devi temple is that while Lord Shiva was carrying the dead body of Sati after she jumped into the fire, her head fell at this place. That is why it was named Sarkanda which changed to Surkanda Devi with the passage of time. This was a small temple where an annual fair is held. We were thinking that how difficult it would be to reach the temple when snowfall begins and also how fabulous would it be to look, from the temple peak, 360 degree around covered in snow. 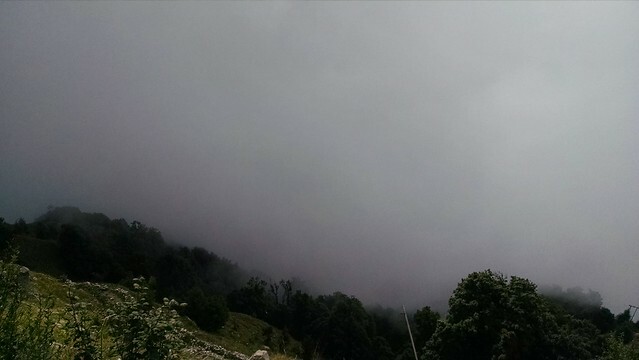 We got to know from a board that we could see cities of Haridwar, Rishikesh, and Roorkee from there, but we could not do that because of thick clouds. While exploring the area nearby we went outside the temple from the other gate directed towards Chamba. This place was not crowded by pilgrims and tourists and we spent some time there playing hide and seek with clouds. We were standing on a peak and the valleys should have looked very deep from there but we could not see that because of ever-present black clouds. Sometimes sunrays appeared at the distant end like silver linings. From Surkanda Devi temple we went to Kanatal, approximately 10 kilometers from there. On the internet, it was one of the famous destinations near Chamba, but there was not much to do apart from a jungle safari. This place must have been popularized by the Club Mahindra resort situated just outside the gates of Eco Park, Kaudia Range. We started our jungle trip after taking passes. It was a jungle trek of around 8 km to the hilly village of Kaudia. Initial stretch was covered with tall Deodar trees but as we went deeper into the jungle those long trees disappeared gradually and were replaced by the trees of all shapes and size. We were very hopeful of seeing snowy peaks from the jungle as suggested by the local people but could not get that too because of clouds. Now deep into the jungle, going up and down with sometimes barely a foot-wide path, meeting small water streams, we kept on moving towards Kaudia. We could not meet any person, no wildlife creature could be spotted except occasional chirruping of the birds. There we thought that we should at least had a small knife or a torch for our safety. Moving on we saw trees with strange shapes, leaves with interesting colors. There came a moment when it was so dark that in photographs only outline of a person could be recognized. We estimated the time it would take us to reach Kaudia and then come back to the main road and that did not allow us to complete the trek. We abandoned the jungle safari midway and left for the Haridwar via Chamba.